Can a bonsai be a text? When we say text, most of us think of typeface, individual letters. I’d like to broaden that definition to include messages that are encoded by abstract symbols. So, for example hieroglyphics are a text. Even though these are a series of pictures, they still inform us as to what rites to perform for the dead, the identity of their kings, etc., etc. But let’s go even further! Could the stained glass windows of a church be a text? Of course. As you walk through the galleries of a Gothic cathedral you see stained glass after stained glass picture, the light of god streaming through it, illustrating the lives of the saints, their works and histories. More than that they give us a sequential order of prayer. They form a cohesive narrative to follow, a hypertext of stories within stories. One acquainted with his or her religious stories and the history of the land would be able to read these, would know the significance of these images. Each would call to mind a particular story with moral instruction. Respect the ruler who built this place. Remember your ancestors. This is what happens if you aren’t Christ-like. Etc., etc. But how abstracted can the nature of text be? Malevich was a Kiev born Russian artist who painted simply a black square as a new kind of artwork, the first painting that wasn’t a painting of anything at all. Simply color that was itself. Malevich’s square, while underwhelming in terms of sheer technical accomplishment, was a creature of its time, a product of the Russian revolution and WW1, it is a Russian icon that does not iconize anyone, only nothingness. We are delivered, though not spoon fed, commentary through this one, singular, abstract symbol. What I think that all of these examples of text illustrate is the fact that, for the signal to be transmitted successfully, one must understand how to extract that signal from the code. 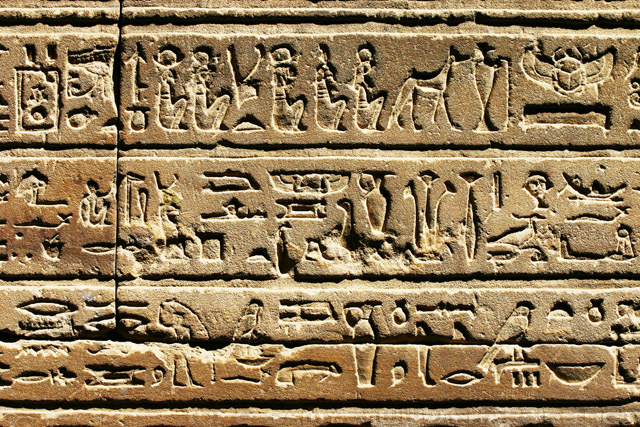 Without a Rosetta stone, the hieroglyphics are simply a series of pictures. 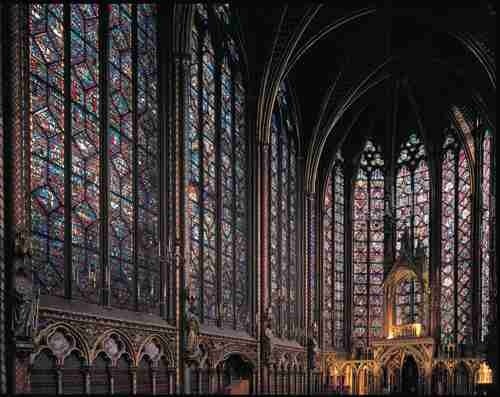 Walk through Sainte Chapelle naive to Catholicism and you will simply see some pretty glass. Without a background in Russian history and modern art you might think Malevich was simply a precocious toddler. So what do we say about trees and text? I’m not opposed to the idea of plants as text – Victorian flowers were so heavily codified that you could deliver a marriage proposal in a vase and reject it with another bouquet. But bonsai, in many cases, are a contextless art. They invoke no narrative, at least, not one that can be shared. A tree will tell the story of its growth, windswept trees will look like they blow in the wind, driftwood trees like they’ve been struck by lightning, but these are not coded. If such things were text, every mountain, every wave, every cloud would be text. We would spend our years continuously reading. Our definition must be broad enough to include Malevich’s square and narrow enough to exclude rocks. To which I say, I really don’t like Rothko that much. My personal feeling is that art, great art, creates a private world between the viewer and the object. It sustains in that world a space where, for just a moment, fantasy becomes reality. The unimaginable becomes possible. The emphasis on naturalism within bonsai is because that naturalism helps build that world, but narratives also do so! We are a storytelling species, our most powerful messages are our stories. I couldn’t tell you how a Greek man built his house, but I could easily give you a summary of the Odyssey. We would be fools to not utilize this power in bonsai. I grant that there may be very many meanings behind bonsai in Japan, China, Indonesia, all of the countries in which bonsai began, but we have taken bonsai to America and we did not bring its context with us. We must invent our own stories for them. So how do you inhere meaning and textual symbolism in trees? By invoking other stories, by creating a rosetta stone of features that a tree tells us. Look at trees from folks like Walter Pall or Nick Lenz. 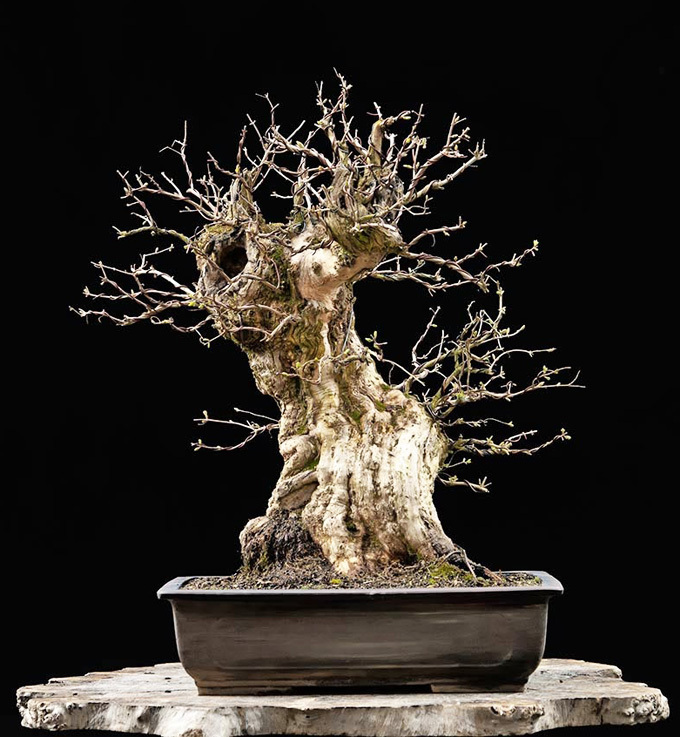 The importance of fairy tale bonsai is not that it allows for the display and rehabilitation of ‘ugly’ trees, but that it gives purchase for a narrative. Here is where the trolls live. This is where the children hide from the witches. That is where Mrs. Mouse raises her family. These narratives and stories are shared, allowing us to read the tree as a text. We know well what stories these trees belong to because we have been hearing the stories since childhood. But this is not the limit to bonsai. What other worlds can we create, stories can we tell? Can we have bonsai from another planet? Can we have root over crystal bonsai? The interaction between adventures in fantasy and naturalism will be delicate and each person must necessarily say where their cutoff is. Does the tree work for you? Does it tell you a story? Does it make you feel? These are the questions we should ask in a bonsai critique, not how well it adheres to this or that rule. Can a bonsai be test is well written and well thought out. I congrtatulate you and am in full agreement. Might I suggest you “by line” you articles. I have no idea of who you are or where you live. Once again, I thank you for a story well done. Thanks for your kind words, I worry sometimes that I’m just rambling crazy talk. My name is Joe Rozek and I live out in the Northeast of the United States. I’m a PhD student studying evolutionary biology, in my spare time I mostly just do bonsai. Will definitely start bylining the articles, thank you for reading! Humanity and bonsai. Sign of the memory.